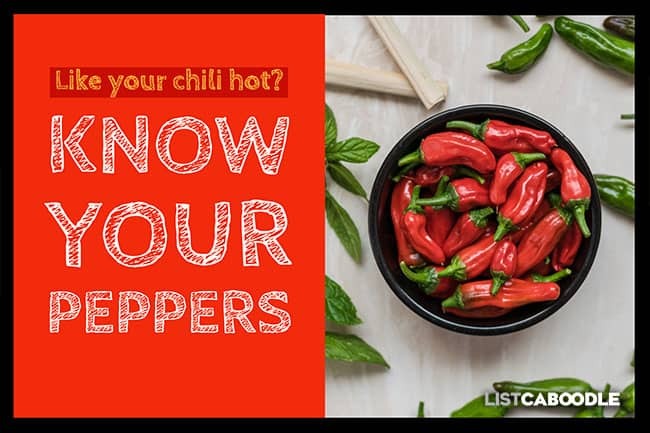 Whether you like the kick of a hot pepper or you prefer a more gentle heat, it pays to know your peppers. There’s a big difference between a banana pepper and ghost pepper. Of the thousands of varieties of peppers, each has its own characteristics. We’ve listed some of the more common varieties here with a brief description of each one. Find out what peppers to try next in your favorite chili recipe! Where does the heat come from in a pepper? All peppers contain capsaicin, a compound believed to work as a defense mechanism against consumption by mammals and also inhibit fungi growth. Capsaicin produces that burning sensation you get when you bite into a hot pepper. If you can stand the heat, capsaicin boasts several health benefits. It works as an analgesic and anti-inflammatory and some believe it has other benefits like inhibiting cancer. What is the Scoville scale for peppers? In 1912 a pharmacist named Wilbur Scoville came up with a way to measure the heat of chili peppers. Named the Scoville Organoleptic Test, it is more commonly known as the Scoville scale. The test basically measures heat sensation by human testers, from 0 to over one million. Units of measurement are called Scoville heat units. Roasting or cooking peppers enhances their sweetness. Eat peppers for your health. Red peppers have the most nutrition since they’ve lasted longest on the vine. They are high in vitamins A and C and also contain antioxidants such as beta carotene which can help maintain healthy skin and vision. Cooking will not diminish the health benefit. Remove inner membrane and seeds for less heat. Capsaicin, the source of spicy heat, is highest (up to 80%) towards the innermost part of the pepper. So removing the inner membrane and seeds will lessen the heat. Eating a very hot pepper can hurt the mouth and throat going down, but there is no physical damage to tissue. Only mammals are sensitive to the heat of capsaicin. Birds are able consume peppers without “feeling the heat”. As a result, they are a main contributor to pepper propagation by eating and then excreting the seeds. Peppers are commonly red or green in color. But they can be found in a broad range of colors including black, orange and even white. The color is simply a matter of ripeness and how it has been prepared. Stuffy nose? Eat a pepper! The heat of a pepper (capsaicin) can sometimes clear mild congestion. November is National Pepper Month. Wear gloves/wash hands thoroughly when handling the hottest peppers. Avoid touching your eyes or any sensitive skin after handling peppers. The heat sensation from a pepper is best neutralized by casein, the main protein found in milk. Caseins act as a detergent, minimizing the capsicin’s heat. You can minimize the effects of capsaicinoids by rinsing your hands with milk or rubbing real butter on them. Any oily compound like vegetable oil or Vaseline will also work. Grill or roast peppers for easier removal of the skins. The hottest pepper is the ghost pepper (or Indian bhut jolokia). The Guinness Book of World Records awarded the ghost pepper this distinction in 2006. Since then, other peppers have been cultivated to top the ghost pepper’s heat, with some registering well over a million Scoville units. Be very careful handling any of these ultra-hot peppers! The Bell pepper is probably the most common sweet pepper. It is typically colored red, green or yellow. This crunchy and juicy pepper can be eaten raw, added to salads or roasted. This pepper is commonly found stuffed inside green olives. It is a sweet red pepper, much like a bell pepper. Ideal for roasting or eating raw with dip. This mild Spanish pepper has a sweet flavor and is perfect for roasting. It is bright red and is great for stuffing. The Guernica is another Spanish pepper with not too much heat. The skin toughens as the pepper matures, so roasting and peeling is recommended. Good stuffed or fried. This familiar pepper is found in both sweet or hot varieties. The pickled version has the least amount of heat. Good grilled or served with meat. This Spanish pepper is tender and sweet. It is commonly fried and served alongside pork or lamb. It makes sense that the Basque Fryer is commonly used in French Basque recipes. It features tender skin and has an unusually twisted shape. When green it has a peppery zest without too much heat. When ripened and red the flavor is sweet. Great for sauces, sautéed or fried with meat. This pepper is named after Anaheim, California and is great for stuffing. The flavor is sweet with a bit of spiciness, although the skin can be a bit tough. Roast for easy peeling. Great in salads, stuffed, or for making salsa verde. This Japanese pepper has thin walls and features a mild heat with a touch of sweetness. Most often used in tempura. The Poblano pepper has good flavor with a kick of heat, but not too overpowering. It is a good pepper for grilling and stuffing. When young, the Poblano is dark green. As it matures and becomes red, it is usually dried—and called Ancho pepper. the Chilaca is used in sauces and roasting, or can be grilled when fresh. It has a medium hot flavor. As it matures, the color turns to dark brown. It is then dried and called pasillas. This ubiquitous pepper can be found in all forms of Mexican cuisine. It is perfect for salsa and commonly pickled. The Jalapeño is named for Jalapa, the capital of Veracruz, Mexico. In its dried and smoked form, it is called chipotle pepper. As you may have guessed, this is the pepper used to make Tabasco® sauce. It was named after the Mexican state of Tabasco. The Serrano is a Mexican pepper. The smaller you find them, the hotter they’ll be. Serranos are good for making hot salsa, guacamole and Mexican cuisine. The peppers are commonly used while still green. After they turn red, the peppers can be pickled or dried. These small peppers are round to triangular in shape and often pickled. Cayenne has a bright red color and is usually dried and powdered for a milder bite. The fresh peppers are very hot. Historically Cayenne has been used medicinally for its healing attributes. These tiny but powerful peppers are also called Bird’s Eye peppers. Thai peppers can be used in both red and green forms. They are commonly found in Thai foods and stir fry. The Habanero is small but powerful. It’s probably the hottest of the commonly found peppers. Judicious use in salsa and hot sauce recipes is recommended. Its color ranges from red to yellow to brown, although it is most commonly orange in color. The pepper was named for Havana, Cuba. This is just a sampling of the many pepper types to explore. We hope it helps you to better know your peppers. Check out a few of them yourself. Enhance your next meal or spice up your chili recipe! You may also be interested in this list of helpful tips and tricks in the kitchen. Do you know the amazing health benefits of the common onion? Learn more about onion facts, tips and quotes.